Share with friends, family and coworkers (don't spam). With "Share the Love" everyone wins and everyone gets rewarded. Whether it's with instant DISCOUNTS or valuable "Love Points". Best of all it's FREE! Good News - you are automatically enrolled if you already have an account. Copy and Share the link: Tell your friends, family and or followers via email, texts, Facebook, Twitter, Pinterest or any "viral" social media outlet to earn valuable "Love Points". You will have to highlight the link and do a traditional "copy" and "paste". If you are using an iPhone, iPad, Android or BlackBerry device just tap the link and use the cut and paste options provided by your device. 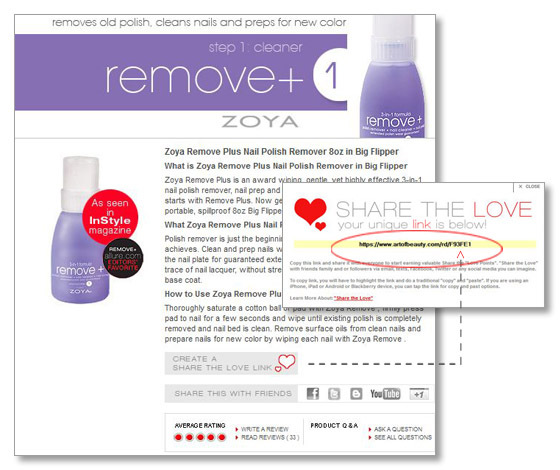 When someone clicks on your personal link and sets up an online account, a $5 coupon a coupon for a FREE Bottle of Zoya Nail Polish will automatically be placed in their account and can be used immediately on their current order. TIP: If you use this coupon and add 2 more polishes to your order, you get free shipping too! The coupon will appear in the "My Coupons/ Promos" section of their "My Account" Page. Share the "Love Points" can be redeemed for valuable coupon code and gifts. Check out the New Monthly Special Redemption Offers in the "Redeem Points" section of your online account. New ones are always being added. Q: What happens if someone already has an account and they click on on the link? A: They will go to the page, but no discounts or points will be allocated. Q: If I create an account after clicking on someones link, can I also refer people and get "Love Points"? A: Yes! Anyone who creates an account can refer people and get "Love Points" if they use their unique personal link for a page. Q: Is the link for each page different? A: Yes! The link for each page is different but you can share as many of them as you like. Each unique link identifies you as the referrer and does not eliminate your other links. Q: What happens if someone clicked on my link, but did not create an account. Do I still get points? Q: What happens if someone clicked on my link and then clicked on another persons link when they created their account? A: The points go to the most recent link used when creating the account. 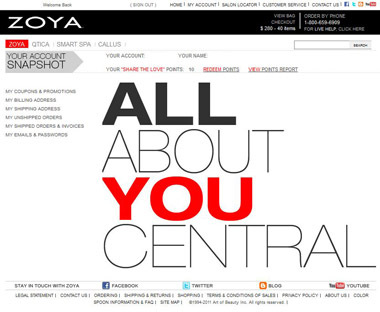 Q: I already have an account and I want to "Share the Love"
A: If you already have an account on www.zoya.com, www.qtica.com or www.artofbeauty.com then all you have to do is log-in. You are automatically enrolled. You can see all your "Share The Love" information on the "My Account" page of the website. There you will see your "Love Points", your "Share The Love" purchase report and redeem your "Share the Love" points. Q: I just created an account after using someones "Share the Love" link. How do I get my $5 Coupon? A: In the "My Account" section of the website click on the "My Coupons/ Promotions" and your coupon code will be there. Remember you may not use this code with any other coupons or offers. Q: How long are Love Points & Coupons valid for? A: Each coupon has an expiration date. Points don't expire, however redemption rewards change. Q: If I redeem a a coupon for a dollar discount, can I apply that to the whole order? A: A coupon for dollars off an order can only be applied towards merchandise. Residual value is not saved.